Graphics, Multimedia and Packaging. We are the premier consultants for the the 21st century’s largest growing industry. Let us help you grow your “420 friendly” business with our Strategy, Marketing, and Branding. We are artists and designers inspired by classic vintage style. 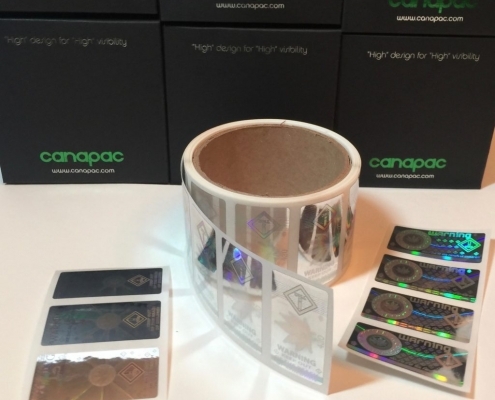 Recognizing a need, in the cannabis industry, for highly reflective tamper-evident safety labels in the emerging edibles market. Especially necessary when quality control is a concern. We were moved to design our original holographic warning labels. Honoring our influences, we wanted to create a label that would stand out. We are always looking for creative and innovative new ways of using contemporary, recycled and hemp materials in order to produce artistic packaging that will become vital in today’s cultural and contemporary design. Let our great product make your already great product even better. From product concept, logo brand design to product placement, we have the vision and strategy to bring your ideas to life. We operate our own professional finishing shop with over 30 years experience in the custom die cut, foil press & specialty packaging business.